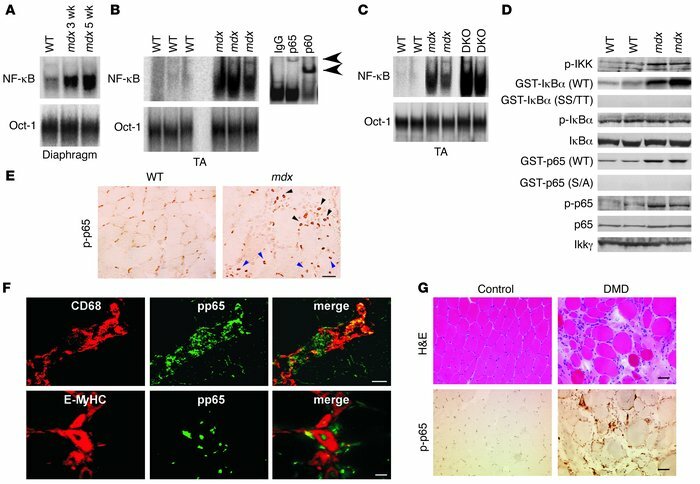 NF-κB activity in dystrophic muscle is localized to both muscle and immune cells. (A–C) Muscle nuclear extracts from 5-week-old WT C57BL/10 and 3- and 5-week-old mdx mice (A), 5-week-old WT and mdx mice (B), or 7-week-old WT, mdx, and DKO mice (C) were used in EMSA for NF-κB and Oct-1. Supershift assays were performed on mdx muscle extracts using antibodies against p65 and p50. Arrowheads denote shifted subunits. (D) IKK assays performed with IκBα WT and mutant (double serine to threonine [SS/TT]) or p65 WT and mutant (serine to alanine [S/A]) substrates using gastrocnemius muscle lysates from 7-week-old WT or mdx mice. Immunoprecipitates were probed for IKKγ as a loading control. Western blots are shown for p-IKK, p-IκBα, IκBα, p-p65, and p65. GST, glutathione-S-transferase. (E) Gastrocnemius muscles from 7-week-old WT or mdx mice were immunostained for p-p65. Scale bars: 50 μm. Black arrowheads denote immune cells, and blue arrowheads indicate regenerating fibers. (F) Muscles from either 4- or 7-week-old mdx mice were double stained with p-p65 (green) and CD68 (red) or p-p65 and E-MyHC (red), respectively. Scale bars: 20 μm. (G) H&E staining and p-p65 immunohistochemistry were performed on muscle biopsies from healthy controls and age-matched DMD patients (n = 4). Scale bar: 50 μm.